The Vollrath 20248 is a half-size wire grate that allows you to cool baked goods, ice cakes, or dry utensils. The rack is constructed of 300-series, 18-8 stainless steel, a heavy-duty alloy that will not warp. There is no plating, meaning the steel will never flake. "The no rust is huge but these are very well made and fit perfectly into the voltath 1/2 sheet." "Great! Heavy duty! Should last a lifetime!" "The heavy gauge steel is great for oven use. No sharp edges were noted on either grate. 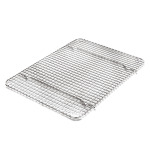 Impressive construction provides confidence of lifelong..."
Perfect stainless steel item for making bacon! "The heavy gauge steel is great for oven use. No sharp edges were noted on either grate. Impressive construction provides confidence of lifelong use." Wonderful cooling grate and more! "This is a nice heavy duty grate that can be used in the oven to cook bacon up to 400 degrees (I called Vollrath to verify temperature). I just love the grate style for cooling cookies and that it's dishwasher safe. Stainless steel cooling racks are hard to find. Great job Vollrath! KaTom got it to me very quickly."